Ahh it's back-to school time here in Tasmania. 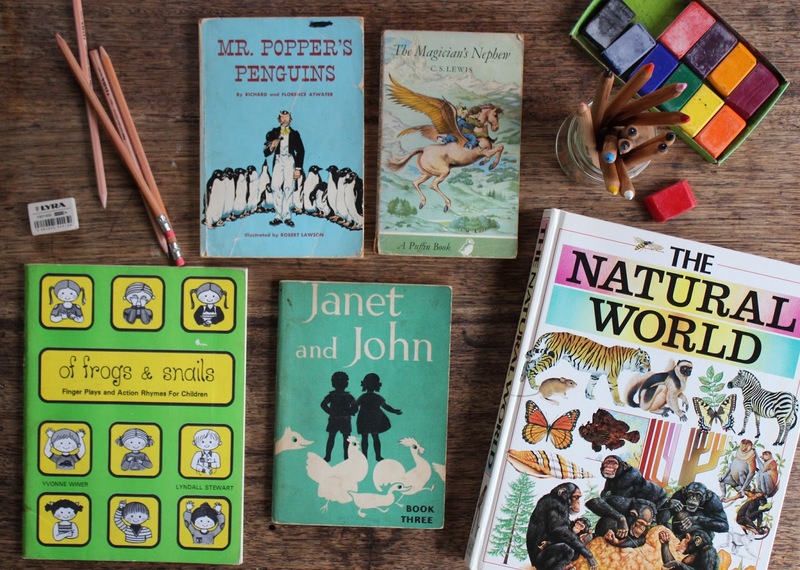 Growing up, I remember fondly those years of booklists, new stationary and contacting books. As a teenager, I made it my job to see if I could find cheaper options of the suggestions on my school book list. It was one of my favourite times of year! As I was gathering up all the materials the owlets have chosen to learn with this year, it struck me just how many of them are now second hand. How inexpensive quality learning materials can be if we seek them out. How little waste we create in our education journey. One of the ways we reduce waste is by educating the owlets at home. As home educators, we receive no financial support from the government, and we sacrifice one full-time income to make the owlets' education possible. We're extremely fortunate to be in a position where we can make that happen, and we do supplement the full-time income I'm no longer making, with the teeny, part-time shop income we make through Spiral Garden. Huz now works four days per week, as a measure for both his sanity, and mine, as a means we get to get all the things done, and spend more time together. We're certainly not making what most would consider to be smart financial decisions here, but they're decisions that keep work and life in balance for us all. Especially while the owlets are young. Borrow tools and curriculum: We've been super fortunate to have been loaned books and curriculum materials when we've needed, by very generous and trusting friends. We're gentle on the books we use, and store them well, so can hand them back at the end of the year with minimal wear. Ask family for any helpful books, games and materials they might be able to share in the short or long-term. They may have something useful in their home, or keep an eye out for something helpful in their travels. Buy secondhand: We're big on searching out good quality second hand books, tools and materials. We've been lucky to have stumbled across gems we can use, for almost nothing. At present, the reader Tiny has chosen to work on her reading with, belonged to my Aunt when she was small. The book Little Owlet has next on her list came from the local community book exchange. One of the maths books Big Owlet is using came from a freebie trolley at the tip shop! And we always keep our eyes open at the tip shop, garage sales and op shops. Many home educating families I know have become expert second-hand buyers, through necessity. It's a wonderful skill and set of values they're passing on to their children. To look for second hand options when possible. To value the words and knowledge in older materials, and to care for belongings well so they'll last for generations. Use supplies that create minimal waste: This year we've switched to writing on loose leaf paper, filed in folders for the different subject areas and projects the owlets are working on. It means there's no paper left unused, like there was in the main lesson books or exercise books they used previously. It also keeps everything together neatly. 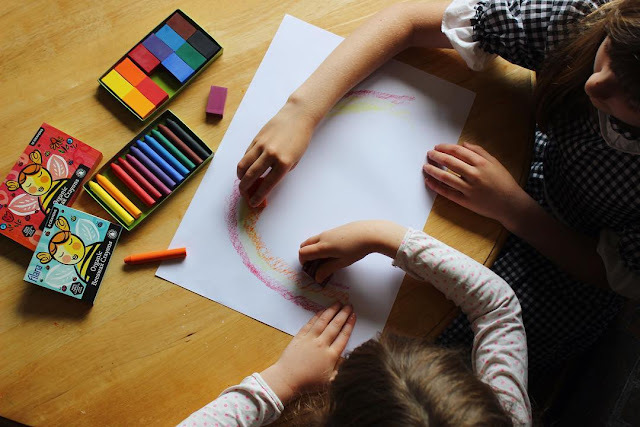 For writing and drawing tools, we use organic beeswax crayons, and pencils which can be sharpened, and their shavings added to the compost or fire. We're about to invest in some fountain pens for the older owlets, too. These can be refilled to use as they need (watch out for these in the shop). We use sturdy watercolour paints in palettes with replaceable paint blocks. These will last a lifetime. We use brown paper masking tape when we need to stick things, and when I've figured out a favourite option for glue (and we've run out of the old stuff we're still using), I'll be sure to update that. We're also about to dip into making art materials by hand, with some brilliant guidance by The Organic Artist, Nick Neddo (we'll blog some of that too). Basically, if it's compostable or reusable, we're all about it. Keep it minimal, and avoid plastics: We look for plastic-free options for materials and resources. Have a think about whether you really need to print or laminate that material you're using. What will happen to it when it's no longer useful to you? Online resources can be a way to access what you need and print only what's useful, but if you do need to use a printer, look for one that requires fewer cartridges and less ink. Is there another way to explore that science project or craft activity without plastics? Or can you approach the concept in a different way? If you're going out for the day, pack a lunchbox and avoid buying plastic-wrapped convenience foods along the way. Use the library: Libraries are such great resources. It's surprising to me how many home educators I've observed will prefer to buy new books rather than borrow them from the library. Having said that, the kids non-fiction section at our local libraries has dropped by 75% in the past year, so if that's happening across the board, I'm kind of getting why you'd buy new books. Most libraries will take requests for new books to buy, so if there's something you're keen to read, try asking for it at the library so others can enjoy it too. Learn in nature: Nature really is the best teacher. Spend time learning real-life lessons, through observation. You can learn everything you need to know about reducing waste, through observing ecosystems. Make sure to leave a light footprint and take everything with you when you're done. Explore it together: Work with your kids on ways to reduce waste in your home and include them in the process. Brainstorm solutions together. Use bulk foods shopping and cooking from scratch as an opportunity to explore mathematical concepts, social interaction, economics, science, geography, history... there's much to learn in the daily runnings of a household and the feeding of a family, and those real-life lessons are so important and valuable. Kids are often quite intuitive about this stuff, so you may learn a thing or two along the way, too! If your kids are learning in a school environment, many of these same principles apply. Chat to your teacher or school and see if you can help create positive change in your school community. You can hear Huz, and our friend Robyn, talking about back-to-school waste on ABC radio here. 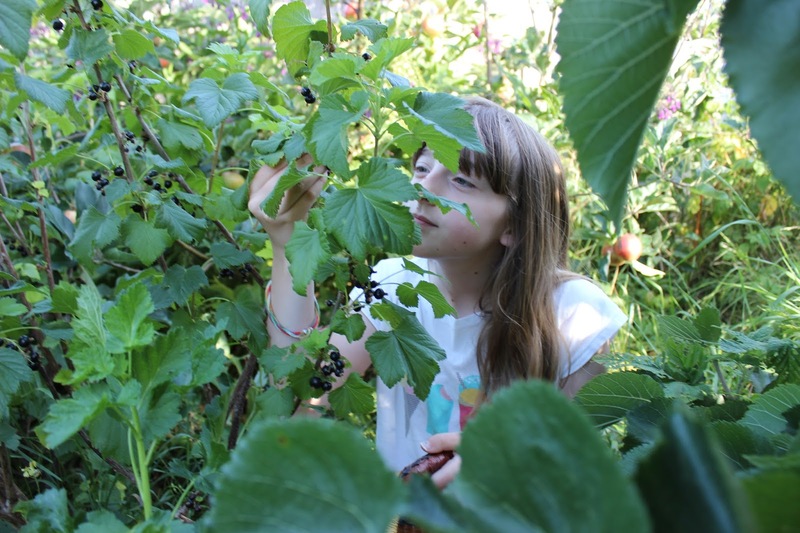 If you're keen to learn more about reducing your family's waste, whether you educate your kids inside or outside the home, you can find more information in our e-courses, Zero Waste Families, and Seedlings: Permaculture for Families. Both courses are self-paced, and ready for you to sign up at any time. We've also written a book which covers all these things and so much more, and will be available at your local bookshop (eep! ), later this year. when i was at school we wrote everything down in our school books, homework included & text books were supplied by the schools, even high school. when my children started going to school I was horrified to learn everything was copied out for them & all they had to do was write answers down! where is the learning in that? also that stupid reading was in where if they didn't know the word they just went past it (missed it) there was no sounding out of words or anything! i had taught my kids how to read before they even started & was sad when the eldest came home & told me I was doing it wrong; so i calmly told her it was how i was taught & then asked her how many can read a full page in your class, i think she mentioned 2 others that was 3 children out of 34 kids! pointed out to her that mummy's way was better & she then agreed too. i did get called in to her class a few times about how i was doing things & told them that as as i was concerned they weren't doing their job as hardly any of the kids could or write. so glad when they changed it back.